In October, the competition in the smartphone market is expected to be fierce. Several flagships will be officially revealed and each device will want to attract as many users as possible. Although phone choice is subjective, there are certain factors that help the OnePlus 6T stand out. Here’s why you should be tempted by this device. OnePlus' strategy is known. Every six months, the manufacturer launches a new device. The OnePlus 6 will, therefore, be leaving soon. To justify its replacement, the brand is, fortunately, offering some new features. If the OnePlus 6T will be the death of the mini-jack plug (a first for the brand! ), the fact remains that the device will offer some interesting features. Finally, a fingerprint reader under the screen! The fingerprint reader is one of the most appreciated features by users. Nowadays they are very fast, allowing you to unlock your smartphone in an instant, and sometimes even benefit from other features. The good news is, a fingerprint reader directly integrated into the screen could be incorporated on the OnePlus 6T. Thus, the smartphone could offer a technology that is almost unprecedented at the moment, especially at the price point (around $500) where the device will be marketed. The manufacturer has confirmed the information to our American CNET colleagues: "We unlock our phones several times a day, and unlocking the screen reduces the number of steps to perform the action. By adding this feature to other screen unlocking methods such as facial recognition, users will have the option of unlocking the device in a much more convenient way for them." 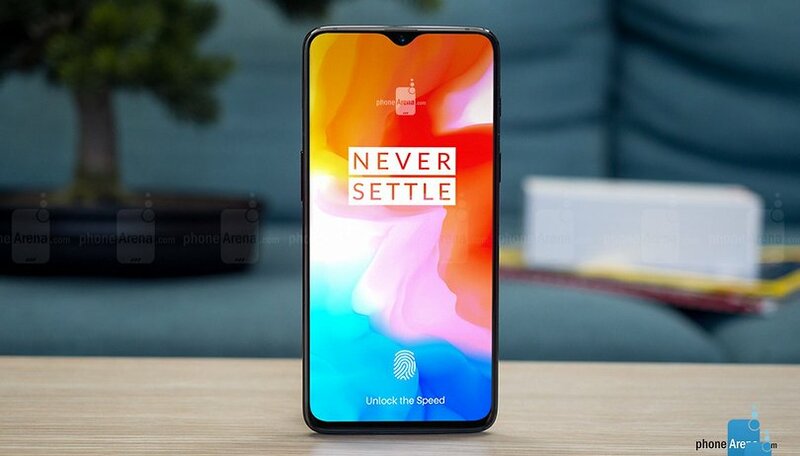 Failing to abandon the notch, OnePlus decided to reduce its size. The OnePlus 6T display will house what has become known as a waterdrop notch. Oppo and OnePlus smartphones are very similar. The recent examples on the OnePlus 6 and Oppo R15 are obvious. The images of the Oppo R17 give us a an idea of the design of the OnePlus 6T, as well as leaks of the device. The OnePlus 6T is will have a 6.41-inch OLED display (compared to 6.28-inches on the OP6) with a resolution of 2340 x 1080 pixels, or a density of 402 pixels per inch. The OnePlus 6 is one of the most powerful smartphones you can find on the market today, with Snapdragon 845 processor and the Adreno 630 graphics chip with 6 or 8 GB of RAM depending on the model. The OnePlus 6T will keep the same datasheet. So we shouldn't have any unpleasant surprises on this side. The Snapdragon 845 remains one of the best processors of the moment. It will be perfectly suitable for all users, even the most demanding. The same applies to the camera. OnePlus should not change its 16 and 20-megapixel sensors from the OnePlus 6. The Chinese manufacturer could offer a software update to improve the photographic experience, which is, so far, the only weak point of the brand. The good news is that OnePlus will offer a bigger battery on this new device than in the OnePlus 6. That should be enough to keep your fingers crossed for longer battery life. Are you planning to buy this smartphone? If not, which will be the standout phone revealed in October for you? What will be the most excited new device revealed this month? The 6t will be a big wet fart. Tmo will only make that mistake once. I'm sure the OnePlus 6T will be a nice device (it's coming to T-Mobile), but just like the Google Pixel? It is no longer a Flagship killer, it is a flagship almost price like an iPhone. I am impressed with the Nokia 6.1 + (and I hope the Nokia 7.1 follows through like a device that's as affordable as a Motorola only with better specs). Its too expensive. Its price point isnt compelling to most of the market anymore. I think it was sort of by design. Oppo, or BBK came up with the whole OnePlus, as a "community", you are part of us idea. Through viral marketing, produce a phone with high quality "flagship" components, then to create brand loyalty/fanboys make it invite only. Make a few, say we are just a humble startup, that cannot produce a lot of phones, so we have to limit the amount we can sell...you gotta have an invite. People BOUGHT that hook line & sinker! People were smashing phones to get an invite, creating videos, anything to get a 300 dollar phone, when most were 500 bucks. Even after it was found out that Oppo was the parent company (only stockholder, BBK is the super parent), it didn't stop the viral marketing. Then came the succeeding generations and once the fan base was established, cut off the invite only stuff. They have a sort of loyal following, which is enough to raise the price each year, to the point that they are approaching some of the higher quality brand phones, and aren't the bargain they once were. Plus, they still have TOO MANY software bugs, out of the gate, and very poor customer service (outside of Asia/India). T-mobile is taking a chance and if the phone doesn't deliver, it will KILL it for any future carrier branding/discount/zero interest sales. Not much of an argument. Me too me too! Look deeper. They are poorly engineered, buggy, crappy customer service, band mismatches and the company can't secure their customer data. IF the OP6T isn't hit with the usual Oppo software bugs, that have screwed up the OnePlus 1, 2, X, 3, 3T, 5, 5T & 6, then they might have better success, especially being finally (in the USA) carrier branded. But the carrier(s) won't put up with a bunch of returns because this feature locks up/doesn't work, or this camera or that doesn't work right, or the fingerprint sensor isn't working...requiring software update after software update to correct. Yes, they are improving, over the past 4 years, but, if you read the OnePlus user forums, they STILL have a lot of glitches, that for the most part, don't affect a lot of the other vendors.